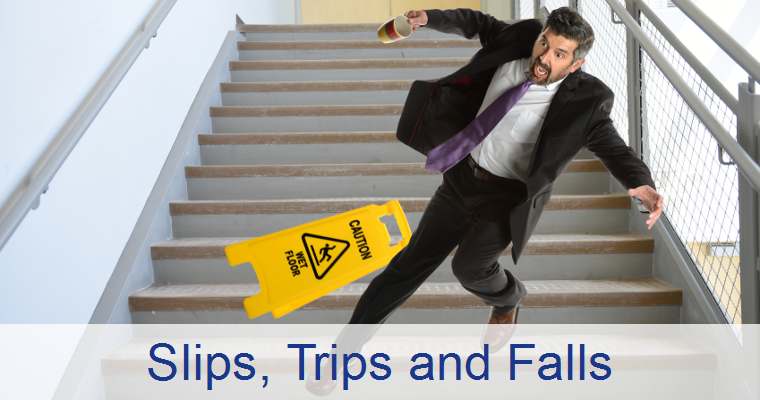 Slips, trips and falls (STF) account for the second largest amount of workplace injuries, both fatal and non-fatal. STF incidents cause an average of six injuries every single working day. They are the highest cause of people missing a month or more of work due to a workplace accident. A number of factors can contribute to an STF incident. A certain number of these accidents may simply be unavoidable or hinging on external factors. However, you may avoid many of them, given proper caution and care, and if risk assessments are exercised. STF incidents can result in a claim whether you are operating a customer-facing organisation or not. Employees, customers or other members of the public may all be eligible to claim should they have such an incident. The Health & Safety authority (HSA) have compiled an information sheet on the most effective measures you can take to prevent STF incidents in the workplace. There are a number of primary factors that can cause an STF accident to occur. We list the most common below, along with the best preventative measures possible to minimize the risks involved. Stairs and steps can be the most dangerous areas of any business. They can fall into disrepair unbeknownst to management and also be affected by a number of external factors. Four interdependent key elements are at play in terms of preventing incidents. 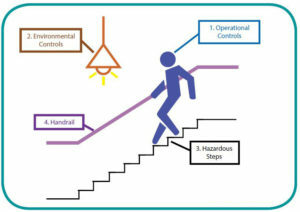 Operational controls: Use rules and policies to prevent accidents. For example, best practices for for employees especially if they are carrying anything up and down stairs and prohibiting hazardous activities. Environmental controls: Remove distractions such as posters. Provide adequate lighting above and below steps if in a dimly lit area. Hazardous steps: Try and maintain the quality of steps as much as possible. Eliminate or control slippery, short or irregular steps. Handrails: Provide properly sited, contrasting handrails that allow a supportive powerful grip. 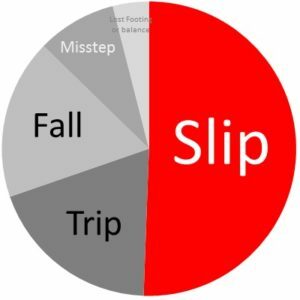 Slips consist of almost half all STF accidents. Generally people will often fall on a flat, even surface when said surface has been wet or contaminated usually with a liquid of some sort. Identification is one of the key areas of making sure that slippery surfaces don’t become too much of a hazard. You should identify what areas will be most likely to suffer contamination with external substances. Preventative measures can then be taken; putting down floor mats, or installing non stick surfaces where possible. Place measures in place to minimize the amount of spills or leakage, anything that may result in a surface becoming slippery. Communicate these risks with proper indicative signage and posters. Alighting from vehicles is one of the most prevalent causes of trips in the transport industry. Lorry drivers and van drivers can both fall victim to a litany of injuries when exiting vehicles. There are three key preventative measures to enforce. Exercise care when getting in and out of your vehicle. Keep vehicle steps well maintained and free from contamination where applicable. Wear comfortable and slip resistant footwear. Cold, icy conditions can more than double the number of slips, trips and falls with December and January being extremely high risk periods. The HSA have developed the ‘WALCS’ system in order for icy high risk periods. Weather: Monitor weather conditions using resources such as “snow or ice” and Low weather” warnings. Activities: Take excessive care if working in icy conditions, ensure you are wearing the correct footwear and be aware of driving advice issued by authorities. Locations: Consider high risk locations such as third party premises, external car parks and entrances. Communication: Ensure a two way hazard communication system is in place. Sample dynamic risk assessments: Continually assess the working conditions and activities and ensure that your control measures are appropriate. This can be particularly prevalent for customer facing businesses. During periods of bad weather entrances and exits can become extremely hazardous in a quick period of time especially if a high volume of people are walking through. Being vigilant is key for safety processes in these instances. Footprints in doorways can indicate high slip risk areas when the weather is bad. The easiest way to rectify this would be ensuring that the inside and outside of doorways are as slip resistant as possible. Along with all of the above best practices safety conscious footwear is a key element of preventing avoidable STF accidents in the workplace. Slip resistant footwear needs to be comfortable and well fitting and worn in all high risk areas. The HSA have been doing Trojan work over recent years to drastically reduce the number of workplace accidents and fatalities over recent years. They are creating handy, easily digestible tips to ensure that any and all preventable accidents are avoided. Make sure you abide by these tips and protect yourself, your employee’s, members of the public and the integrity of your business. The full HSA report can be accessed here. Abiding by these trips is one of the main measures you can take to minimize the impact accidents can have on your business. Another key measure you can take is getting public and/or employers liability cover in place. Speak to one of our dedicated liability specialists by calling 01 660 6900 or fill out our quick online quote form here.